Have you heard the phrase “cleaning with kids in the house is like brushing your teeth while eating Oreos”? Spring cleaning with small children can be frustrating. Use these 5 tips and tricks to actually get the job done in a way that’s fun for you and your little helpers. Welcome to “Ask Kenarry,” a feature on our blog, where our friends, fans and followers ask us to gather ideas for their home or family. The question most recently posed was “What ideas do you have for spring cleaning with small children?” We threw out the question to our followers on social media and gathered five tips and tricks to help you minimize the frustration of spring cleaning with small children. Little helpers can be a big help if you implement these ideas. 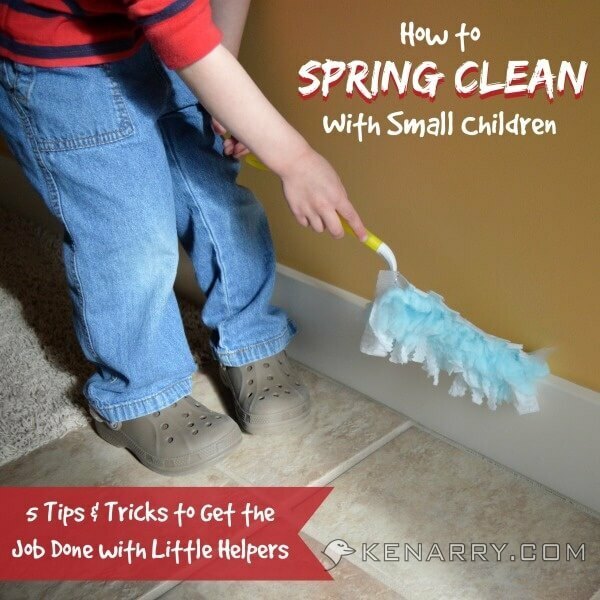 ASK KENARRY QUESTION: What ideas do you have for spring cleaning with small children? It’s spring cleaning time! Our question this month comes from a friend of mine who has two small children, ages 4 and 5. She knows toddlers and young children naturally love to help, but are often in the way or under foot. She asked us to gather some ideas to help her accomplish spring cleaning with small children. Spring Cleaning Tip #1: Make it a family event and give them jobs to do. Small children have short attention spans, so this year we’ve been setting aside one morning a week to tackle a spring cleaning project. We call it “Workin’ Wednesdays” and pick one or two goals to accomplish together like organizing the pantry or cleaning out the refrigerator. Spring Cleaning Tip #2: Be patient, even if it takes longer to clean. Our son wants to be with us doing whatever we’re doing. He naturally wants to be a big helper. Sometimes, though, it’s hard to let him help when I know it’s going to take twice as long. I have to remind myself it’s a great opportunity to teach him how to clean and care for our home. I figure it ought to pay off in the long run when he’s older and really can be a huge help to us. It may be wishful thinking, but maybe then we can get the job done in half the time? 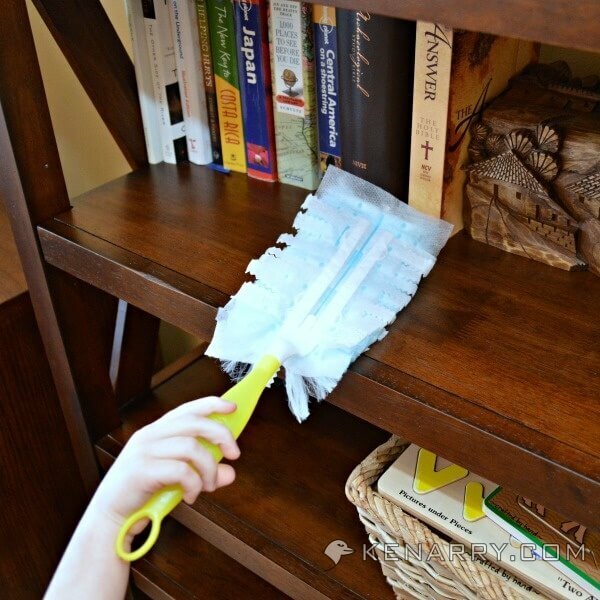 Spring Cleaning Tip #3: Give the kids their own cleaning tools and supplies.
. He loves to follow along behind me and dust whatever surface I just dusted – or really anything he can find, including the dog. for spring cleaning with small children. Spring Cleaning with Small Children Tip #4: Crank up the music. We make it into a cleaning party with loud music. At any time, one of us calls out “dance break” where everyone stops what they’re doing for a moment of silliness and dancing. Spring Cleaning with Small Children Tip #5: Lower your expectations. Looking for other cleaning tips? Follow our Pinterest board for cleaning and organizing ideas. What are your favorite ways to accomplish spring cleaning with small children? Please comment below to share with our readers. Our oldest son is in school for the first time this year. We’re wondering if it’s customary to give teachers an end of the year appreciation gift. If so, what ideas do you have and (if you don’t mind sharing) how much do you typically spend per teacher? Please comment below to share your ideas. Your ideas may be selected for next month’s Ask Kenarry! Ask Kenarry is a regular feature, where one of our friends, fans or followers asks us to gather ideas for their home or family. Each month, we start by asking our followers on social media for ideas. 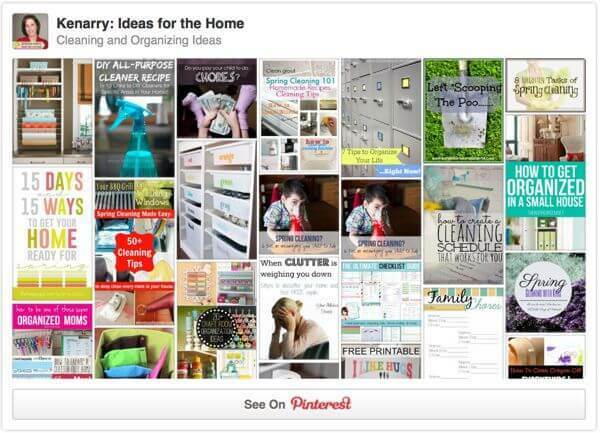 If necessary, we also gather additional ideas through our own searches on Pinterest or other online resources. As we share our findings, we make every effort to attribute ideas to their rightful owners and have received their permission to share these ideas, photos and links on our website. If you’re having trouble coming up with ideas for your home and would like our help, please Ask Kenarry. Great tips! Found you via Eat. Create. Party! I especially love the tips about making it a family activity and lowering your expectations. Small kids (I have two in my house) have such small attention spans. Btw, if you’re interested, I have a link party over at Gingerly Made that runs from Wednesday night through Saturday night. I’d love to have you over. Have a great rest of the week! So glad you stopped by Ginger! We appreciate your comments — and thank you for the invitation to your link party! My sons used to love helping with Spring Cleaning, now as young men they have their own chores but would prefer not to do them – lol! Thanks for sharing and linking up with us at the #WWDParty. Oh boy! I can only imagine, Antionette! Sounds like I’d better enjoy the help now, then while my little guys are enthusiastic about it. Thanks for stopping by Shanice! I appreciate the invite to your party. Have a great Sunday! Great tips. Thanks for linking to the WWDParty! Such great tips! Too often I try to entertain my kids with other things while I clean instead of letting them help when really that’s what they’d prefer to do. Plus it’s a great teaching opportunity. Thanks for linking up to the Link’n Blog linky party! I’m choosing you as one of the features for this weeks linky party! Thank you SO much, Hanna! You just made my day. I’ll keep an eye out for the feature on Link’n Blogs later this week. Love this! Just wanted you to know that you’re being featured this week at the Weekend Wind-Down link Party! Have a great week! Congrats! You’ve been featured at Link’n Blogs. Come by the party to see your feature and link up again! Thank you letting us know, Daniela! We’re thrilled! Thanks, Angela! We’re thrilled you featured us this week. Cleaning with children around can be difficult, thanks for the tips! Wonderful tips! I think it is vital to include kids in all of the family activities as part of their upbringing! With three little ones at home I can honestly say it is an excellent influence!